Evergreen Foam Mattress - Is a FIRM handmade in USA Mattress ! The Evergreen Foam Mattress - Is a FIRM handmade green sleep solution at a great price. 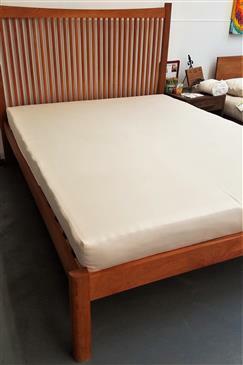 The Evergreen Foam mattress which is made with a 6" eco-friendly foam core wrapped in pure wool and encased in a 100% cotton casing is handmade in the US by White Lotus Home. This mattress is very firm as the description states, which is what I wanted. My mattress was way too soft and causing back issues. There was no smell to this mattress out of the package which was such a nice change, no airing out of nasty chemicals. Great mattress. I purchased a green cotton topper to go on it to make it just a little bit softer. What are the dimensions of the twin XL Evergreen foam mattress? I want to make sure it's the same size as the current twin XL we have.